It’s no surprise to hear of a rabbit named Harvey, ever since Elwood Dowd’s six-foot three-and-a-half inch invisible rabbit of the same name made it to the silver screen in 1950. But Liz Schloegel of Ames, IA, says her Harvey is often more like Harvey Dent, the two-faced nemesis of Batman. Harvey Dent likes to do a little home decorating in his three-story condo. Liz, who is in veterinary school, decided she needed a rabbit to keep both her and her 18-year-old cat company. She did her homework about rabbits and decided on a Netherland Dwarf breed and began to browse on Petfinder to find one to adopt. That left the “handful.” It took several people to corral him into a pen with Liz. And then Orbit surprised everyone by curling up in Liz’s lap for a nap. For her, that was all it took; she adopted him. “He earned himself the new name of Harvey Dent (he can be a little two-faced with his moods, especially at feeding time! ),” Liz says. 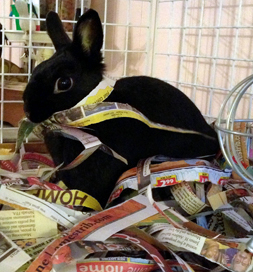 “He is now the proud king of a three-level condo bunny mansion….His favorite activities are burying himself in his shredded paper digging box and throwing things down the three levels of his condo (he’s quite the interior decorator). Harvey Dent has turned out to be every bit as entertaining and charming as Elwood Dowd’s Harvey, but he’s certainly not invisible. “He enjoys being mischievous every chance he gets,” she says. He chose Liz and has enriched her life more than she ever expected.